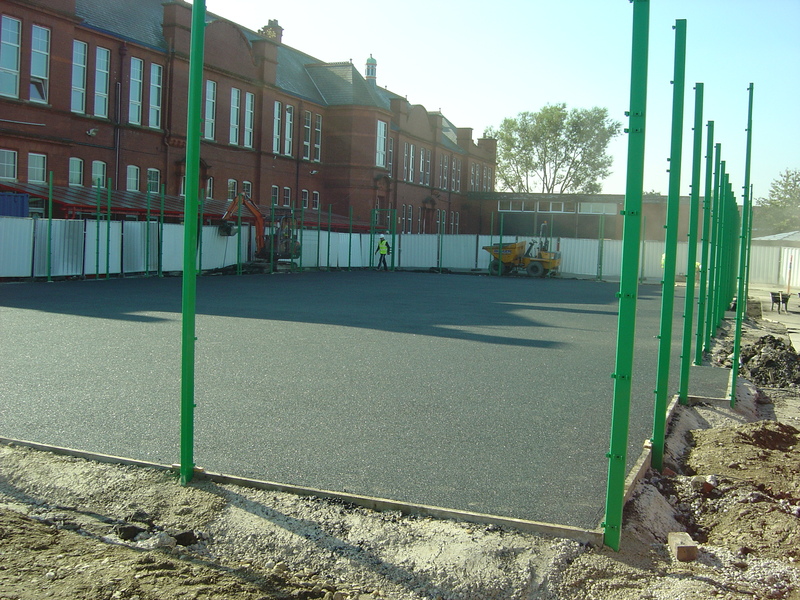 One of our recent projects was the construction of a polymeric basketball court for a school in Manchester who wanted to renovate an existing sports surface and turn it into a multi use games area. We carried out the full installation of the rubber court surfacing as well as additional rebound fencing to keep the sports facility secure and stop equipment from getting lost. Many schools and clubs in the UK choose to have polymeric basketball court surfacing installed as this is a versatile and durable sports flooring specification. Polymeric rubber surfacing can be used for other sports and activities such as netball and tennis as well as basketball, this means the school can get the maximum amount of use out of the new facility. The installation process for this polymeric basketball court began with preparation works to excavate the existing ground and install a specialist sports court sub base. This sub base layer was made up of permeable angular stones which are typically used for sports surfaces because they lock together easily and give the surfacing a stable and strong foundation to lie on. Next we had to apply a macadam base layer on top of the stone sub base to create the right characteristics for the polymeric rubber surfacing to be installed onto. We then installed specialist twin bar rebound sports fencing around the perimeter of the court area with goal recesses and basketball hoops. This type of fencing is used for the polymeric basketball court because it is strong enough to keep the facility secure, as well as having good resistance against heavy use with many different sports. Once the foundations were prepared and the fencing was put in place, we installed the polymeric rubber surfacing itself, this was done by laying out the polymeric EPDM mixture onto the macadam base and allowing it to cure. 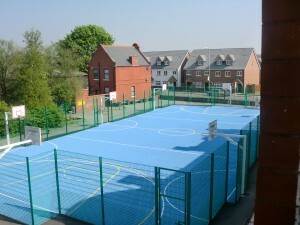 The school chose to have their polymeric basketball court installed in blue EPDM rubber with yellow and white multi purpose basketball and football line markings. The line markings were applied in polyurethane anti slip paint to give clear and long lasting markings which will not fade over time. This will enable the facility to be used during PE lessons and in extra curricular sporting activities. 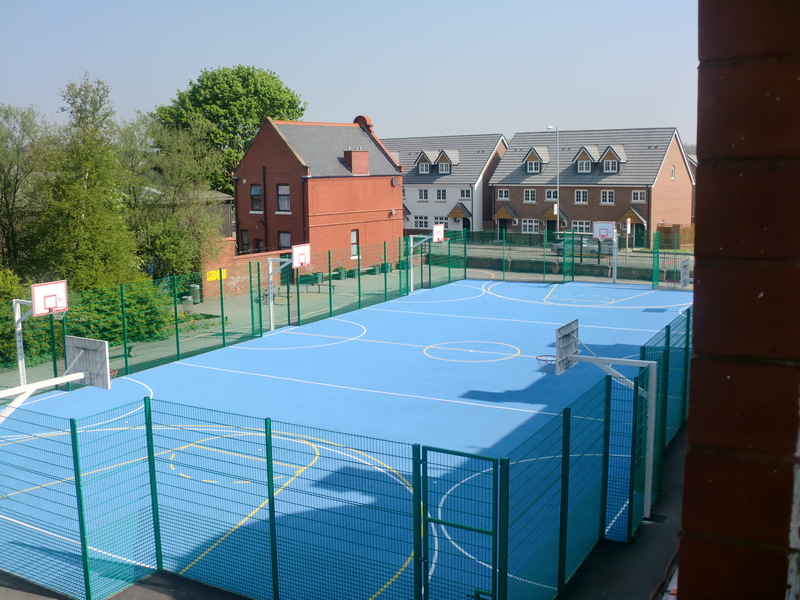 After the full construction process for the polymeric basketball court was complete, the Manchester school were left with a brand new all purpose sports facility in durable and versatile EPDM rubber surfacing. This polymeric surface specification is commonly used for MUGA sports courts because of it’s good ball bounce qualities and performance capabilities, it can also be used for athletics tracks and long jump runway surfaces. The staff and students of the school are all very happy with the final result of the basketball court and will be putting it to good use during lessons and after school clubs and activities. Over the years, we have designed and installed a huge number of these polymeric sports court surfaces for different organisations such as schools, colleges and public sports facilities. We carry out the full construction including groundworks, surfacing in different specifications and additional extras like fencing and floodlighting to help you use your sports surface to its full potential. Please go to our website at https://www.sportsandsafetysurfaces.co.uk/ to see our full range of sports surfaces including macadam courts, synthetic grass and needlepunch flooring. You can also use our contact form to tell us about your enquiry and we’ll be able to give you some advice on prices and designs for your individual project. Don’t hesitate to leave us a comment below if you have a question about polymeric basketball court surfacing or any of our other products. Feel free to share this article as well if you thought it was interesting!